I have been in the gutter business all my life, from working with my Dad and brother while growing up, to starting my own company in Douglasville, Georgia, 48 years ago. My staff is experienced, efficient, and professional, most having been with me for over 20 years. Occasionally we work on a building with simply elegant and exceptional architecture. We appreciate Moon Bros. for allowing us to be a part of this beautiful project. 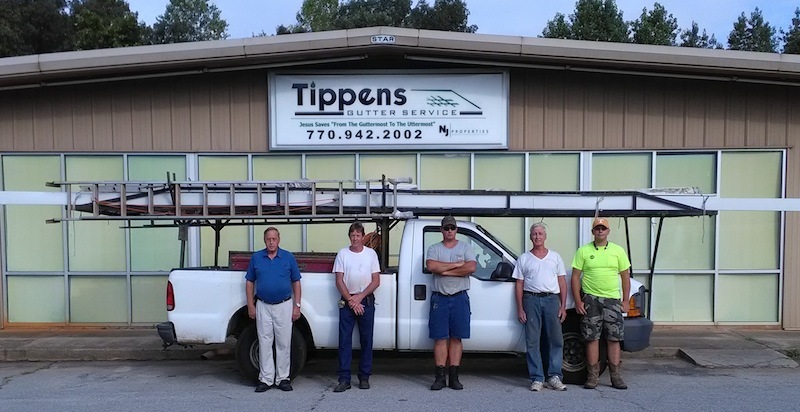 We service all of metro Atlanta installing new gutters and maintaining old ones including cleaning, doing both residential and commercial work. We specialize in the installation of copper gutters both K style and half round with round or square downspouts and 5" and 6" continuous aluminium gutter. We do sheet metal work, chimney caps, chimney pans and shrouds, and flashings. We are especially grateful for the many thank you letters and personal notes we continue to recieve from our clients. We've solved problems for low-rise, hi-rise and straight commercial buildings and in each and every case, we have come in on time and on budget, without interfering with other subs equipment or schedules. We've had many years experience working in the area of new construction! We've made it our business to "look" before we install. Not every problem can be solved with the same answer. We fit the solution to the situation and have very satisfied customers as a result. © Copyright 2016. Tippens Gutter Service. All rights reserved. Web Development by InterData Access Corporation.